Over the last 24 hours, Russian-terrorist forces in Donbas shelled the positions of Ukrainian troops and civilian objects from infantry and heavy infantry weapons, artillery, and armored vehicles. The positions of ATO forces were repeatedly shelled in the vicinity of Pisky and Opytne, fire strikes were inflicted on positions near Avdiivka, several mine explosions were recorded in the vicinity of Vodyane. Terrorists used 82- and 120-mm mortars, as well as SPG-9 “Kopye” during these attacks. Two firestrikes were made from ZU-23-2 anti-aircraft systems mounted on vehicles. In the vicinity of Shumy and Leninske, several insurgent infantry groups invaded the “neutral zone” and shelled the outposts and forward positions of ATO forces from small arms and heavy machine guns. Ukrainian troops returned fire, forcing the enemy to return to its starting positions. Several enemy sniper teams are operating on the Mariinka – Shumy stretch. These groups fight using the same tactics: they approach the forward positions of the ATO forces under cover of their unit’s small arms fire, they disguise themselves, open fire on command, and then, they step back to their starting positions under cover of their insurgent unit’s small arms fire (sometimes – mortars). A sniper terrorist group that uses the same tactics has been observed in the vicinity of ​​Shyroka Balka (Artemivsk direction). An insurgent sabotage and reconnaissance group (12 people) has been discovered by a military guard near an outpost of Ukrainian troops. After a brief firefight, the enemy sabotage and reconnaissance group retreated to the Syhnalne – Olenivka stretch. Near Shyrokyne, terrorists fired using 82- and 120-mm mortars, AGS-17 “Plamya” automatic grenade launchers, and SPG-9 mounted grenade launchers. Several fire strikes from 122-mm artillery have been observed (the [strikes] adjusted due to the change of firing positions of the insurgent artillery units). 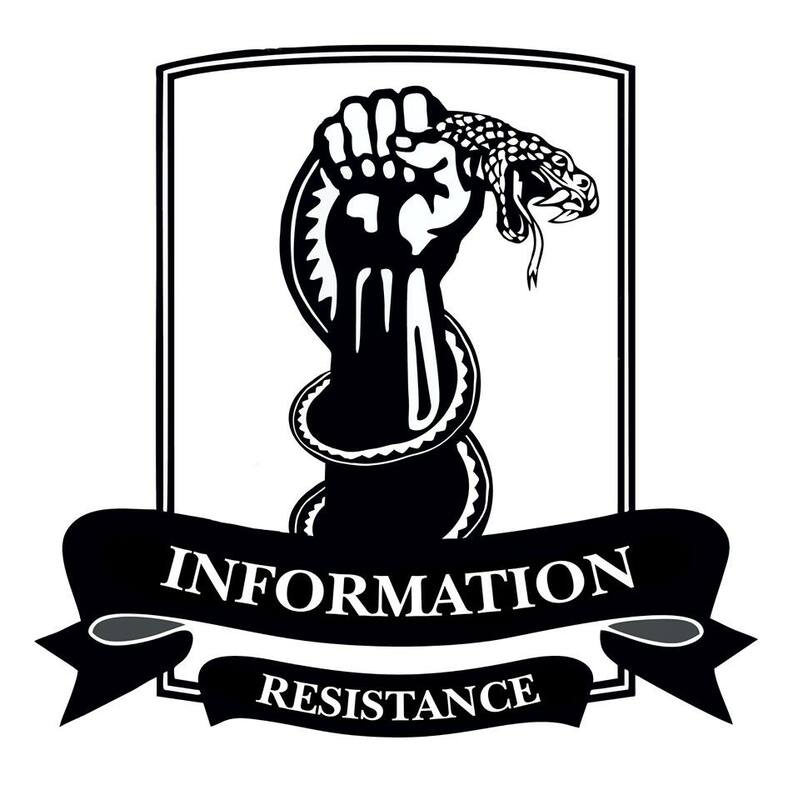 In the vicinity of Shchastya, Trokhizbenka, and Zolote active armed clashes continued between insurgent sabotage and reconnaissance groups and the ATO forces. Positions of Ukrainian troops in the vicinity of Shchastya received aimed fired from machine guns and AGS-17. The enemy used tanks, BTR-80, and BMP-2 to fire north of Yasynuvata near Troitske. During the past 24 hours, insurgents continued intensive road transports on occupied territory. The most active movement of transport has been observed in the vicinity of Donetsk and Luhansk. Two convoys have been observed between Alchevsk and Luhansk (6 and 13 vehicles respectively). One of the convoys was escorted by a BTR-80. In addition, active transport movement has been recorded between Amvrosiivka – Starobesheve – Dokuchajevsk (a tactical group centered between Dokuchajevsk and Olenivka replenishes material and technical resources). • A “DNR army” unit numbering 150-160 people has arrived in the vicinity of ​​Spartak. The unit includes mortar crew detachements (three 82-mm mortars), four IFVs [infantry fighting vehicles], and up to 10 trucks. • A local terrorist “battalion” in the Petrovskyi district of Donetsk has held a rotation and received reinforcements (for resupply up to 50 insurgents came with small arms and 3 SPG-9 units came from the south). • The movement of armored vehicles has been observed between Yasynuvata and Horlivka: 11-12 vehicles proceeded in the northern direction (six of them – tanks). Insurgents set up a service center for armored vehicles near Panteleymonivka. • The transfer of terrorist equipment and weapons continues between Pervomaisk – Stakhanov – Donetsk. Seven tanks and four ACVs have been transferred from Stakhanov towards the Bakhmut highway (three BMP-2 and a MT-LB). Six APCs and ACVs have been moved to Pervomaisk. Three D-30 howitzers on a trailer and two APCs have been transferred towards Perevalsk through Debaltseve and Chornukhyne. 18 ACVs and five or six tanks have been moved from Oleksandrivsk towards Zholobok. • There is continued transfer of military equipment to insurgent “training centers” near Lutuhyne from Luhansk and Krasnodon; some of the equipment is transported from the Russian Federation by Russian servicemen. During the past 24 hours, we observed four BTR-80, two 80A\82A APCs, an armored reconnaissance and patrol vehicle, two BTR-70 APCs and four MT-LB armored towing vehicles being transferred to these “educational centers” (the latter vehicles – as modified artillery fire control vehicles). Currently, terrorist units from the “LNR army” get trained near Lutuhyne for operations in the northern districts of Luhansk region. 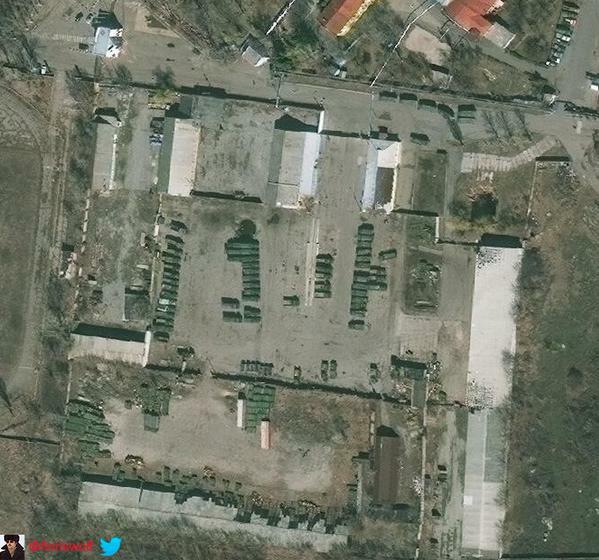 Insurgent base in Luhansk was empty a short time ago, now jam packed with kit and ammo. See earlier. Source. 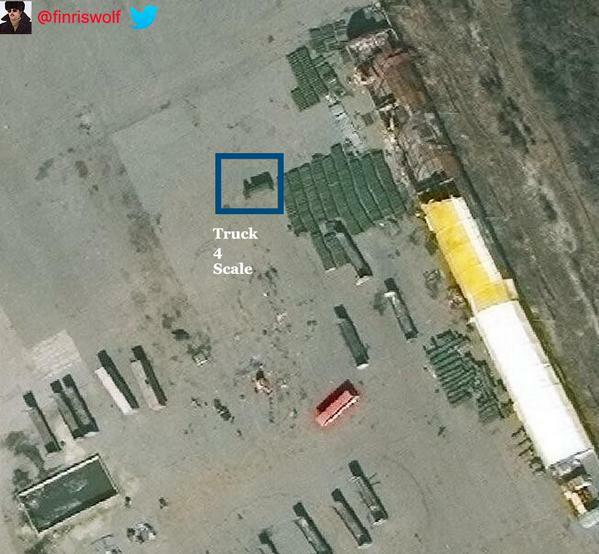 There are probably 30-40 sites in Luhansk with kilometer after kilometer of ammo boxes in the open air. Source. This entry was posted in Dmitry Tymchuk, English, English News, Pictures, South&Eastern Ukraine, War in Donbas and tagged #freekohver, #FreeKolchenko, #FreeKostenko, #FreeSavchenko, #freesentsov, #Information_Resistance, #RussiaInvadedUkraine, #StopRussianAggression, #UkraineUnderAttack, Dmitry Tymchuk. Bookmark the permalink.